The Æsir are a tribe of gods descended from Borr, who’s father was Búri, the ancestor of the gods who was licked from the ice by the sacred cow, Auðumbla. Borr married Bestla, a jötunn descended from the first being, Ýmir, a primal frost giant. The myths record that Boor and Bestla had three children: Óðin, Vili, and Vé. Thus the entire race of gods was spawned. As the creation myths progress, a third tribe is introduced – the Vanir – and no description is given of their origin. We can assume that they also originated from Búri, as he was the first non-giant to manifest in the ice, but we have no recorded lineage for this second tribe. The Æsir are distinct from the Jötnar and the Vanir, but any of these tribes who married an Ás (the singular form of Æsir) was also deemed Æsir. In this sense, the Æsir were the unified family of gods who ruled Ásgard. In the myths, the Æsir and the Vanir tribes waged wars against each other, until it was determined that neither side could best the other. Peace was struck between the two enemies, and hostages were exchanged to solidify the peace treaty. The god Kvasir was formed by Óðin out of the combined spit of the two tribes used to seal the deal. Thor, son of Óðin and Jörð. Guardian of Miðgarðr. Baldr, son of Óðin and Frigga. God of peace and beauty. Höðr, Baldr’s blind twin. God of the unknown. Njörðr, a Vanir and god of the sea. Freyr, son of Njörðr, and also a Vanir. God of fertility. 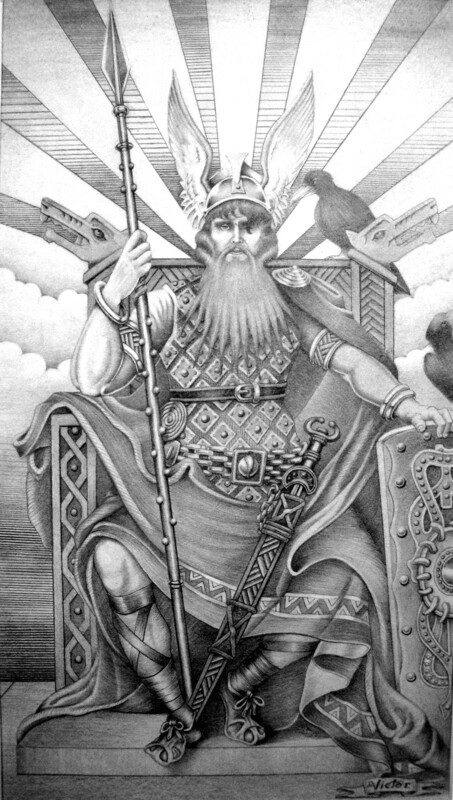 Týr, god of war and law, who’s parentage is uncertain. Bragi, son of Óðin and Gunnlöð. God of music and poetry. Heimdallr, guardian of Bifröst. Unknown parentage. Víðarr, son of Óðin and Gerð. God of silence. Váli, son of Óðin and Rindr. God of vengeance. Ullr, son of Sif and an unknown father. God of archery, skiing, and single combat. Forseti, son of Baldr and Nanna. God of justice and arbitration. Though not listed here, Óðin and Loki are also considered a part of the ruling family. Óðin is usually the elected head of the gods of Ásgard, deferred to in most matters requiring action. Loki is a companion to Thor, somehow shares an oath with Óðin, and is a featured character in much of the lore. Snorri makes a point to note that he has not been listed because of the misery he brings down upon the gods later. Frigga, daughter of Fjörgynn and Jörð. Goddess of marriage and the home. Freya, daughter of Njörðr and also a Vanir. Goddess of fertility. Eir, handmaiden of Frigga. Goddess of healing. Sága, handmaiden of Frigga. Goddess of literature and history. Gefjion, handmaiden of Frigga. Goddess of women. Fulla, handmaiden of Frigga. Goddess of secrets. Sjöfn, handmaiden of Frigga. Goddess of siblings and family relations. Lofn, handmaiden of Frigga. Goddess of unconventional marriages. Var, handmaiden of Frigga. Goddess of oaths and contracts. Vör, handmaiden of Frigga. Goddess of visions. Syn, handmaiden of Frigga. Goddess of boundaries and security. Hlín, handmaiden of Frigga. Goddess of children. Snotra, handmaiden of Frigga. Goddess of social etiquette. Gná, handmaiden of Frigga. Goddess of communication. There are, of course, many additional gods and goddesses who join the Æsir family and are attested by Snorri, so it’s not certain why this list in the early portion of the Edda is limited to just fourteen gods of each gender. Conspicuous is the absence of some very important goddesses, including Iðunn, the wife of Bragi, and Sif, the wife of Thor – both of whom play starring roles in their own stories. Then there is Skaði, who marries into the pantheon through Njörðr, and Baldr’s wife Nanna, who dies at his funeral and returns with him after Ragnarök. Sól and Máni, the female sun and the male moon respectively, are also important characters in the Æsir pantheon, and Mímir as well. Some children of the gods are listed (such as Ullr, Bragi, and Thor) but others are not, including Móði, Magni, and Þrúðr, children of Thor, and Hermóðr, another son of Óðin. Óðin’s brothers, Vili, Vé, and Hœnir are also left out. The Æsir were self-appointed guardians of humankind, striving to care and support them. After creating Miðgarðr from the slain body of their foe, Ýmir, the three brothers – Óðin, Vili, and Vé – create a perimeter to keep Jötunheimr separate from the delicate new world. They come upon a couple of ash and birch driftwood logs, and create the first man and woman. Each of the brothers endows the new beings with a special gift, and they set them loose on the fertile Earth, watching over their progress through the ages. It is to Óðin’s sorrow that he learns of the future destruction of the gods, not only for his own Æsir family, but also his human children. When the great wall of Asgard is sundered and when Thor’s hammer, Mjölnir is stolen, Óðin laments that the gods should be unable to protect Miðgarðr from the Jötnar, and the righting of these wrongs becomes a great priority for the entire pantheon. There are many theories regarding the origins of the Æsir. It is speculated that the Æsir and Vanir represent two separate, ancient clans who clashed in distant history, and the myths detail an old memory of this clash and reconciliation. After centuries of oral tradition, embellishment, and aggrandizing, the players have become powerful gods, working wonders within a vivid, fantastical world. Another theory is that the gods of one tribe were displaced or adopted by another tribe, either in a natural drifting of cultural influences between two neighbouring tribes, or through a war over land rights. It’s common enough for two neighbouring cultures to influence one another and share and swap stories, social norms, and even deities. The gods may also simply be a poetic mirror of the existing clan structure of the time. They may represent a family conflict that would be all too familiar to any Old Norse family unit. The myths detail proper conduct between kinsmen, and illustrate the chaotic results of flaunting this code of conduct and clan ties. The Vanir are generally considered to have originated in a fertility or earth pantheon, while the Æsir are generally considered to have originated in a war or sky pantheon. As a combined family in Asgard, the two seem to compliment each other very well, with some overlap, but enough distinct personality and responsibility to set each god apart. As a blended family, the Æsir are a good representation of the people of the time. As the Norse and Germanic culture spread throughout Europe, neighbouring people’s were absorbed into the whole, and their gods came with them. Take the Saami of Finland, for instance, who most likely contributed the god Ullr to the Asgardian pantheon. As a head deity of the Saami, Ullr has many “chieftan” traits and responsibilities in common with Óðin, the head of the Æsir. Once absorbed by the Norse, Ullr is given a secondary place in his new family, but his original traits are still there. Gods such as Týr and Heimdallr may have joined the Asgard family in the same manner. Gold, blue, and white. Sky and inclement weather themes. The rune Óss.